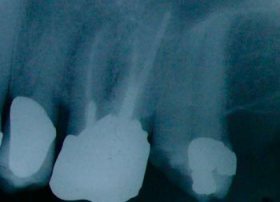 The Alternatives to Root Canal - What Are They? There aren't many alternatives to root canal treatment. Not in the long term - in fact, in the end, there's only one alternative to root canal, and that's to get the tooth pulled. If you want a long-term solution, you will have to make a decision. It doesn't matter much WHY your tooth needs a root canal. Either the nerve is dying, and you have toothache. OR the nerve is dead already, and you have a tooth infection. Root canal treatment has a good chance of saving the tooth for you. OR you may decide to have the tooth out. However, if you're reading this page, I have to assume that you are interested in keeping your tooth. But you are concerned about the treatment, and are interested in alternatives to root canal. Fear of pain or discomfort. You may be worried that root canal is going to hurt. The cost. For sure, root canal treatment is not cheap, especially if you are being treated by a specialist (endodontist). Concern that the tooth may not be strong enough to take the procedure. How long will the tooth last afterwards? After all, who wants to blow $1000 on a root canal, only to have the tooth break up six months down the line? You may be worried about being able to keep your mouth open for such a long procedure. And you may need two or even three appointments! In addition to the length of the appointments, you normally also need a thin latex sheet placed over the tooth, like a surgical drape. It's called a "rubber dam". It helps keep saliva and therefore bacteria out of the tooth during treatment. Let me tackle these possible problems one by one. Pain. This should not be an issue. Modern dental anesthetics are extremely effective. If you regularly experience pain at your dentist' office for normal treatment, switch dentist. Ask around your friends and work colleagues for a dentist where they never feel anything. There's more about this at my page on Dental Anesthetics. Cost. There's no denying this one. It's going to cost you. BUT unless you are happy to have the tooth extracted and walk around with a gap, root canal treatment is much cheaper than getting the tooth pulled and replacing it with a dental implant or fixed bridge. How long will the tooth last? Nobody knows the answer to this one. You are gong to have to trust your dentist's opinion. He is the guy with all the information about your tooth, the guy with years of training and experience behind him. Ya gotta trust him. Long appointments. Again, there's no denying that root canal takes a lot of time. However, it's possible to reduce your stress in several ways. You may be given a small rubber "prop" to put between your back teeth, to rest your jaw on. This stops you having to "stretch" constantly to stay open wide enough. All root canal procedures should be done with a small rubber drape over the tooth. This stops water going down your throat. Music or video. These days a lot of dentists have relaxing music playing in the operatory. Or you may prefer to bring your own choice of music on an iPod! Also, some offices offer "video glasses", where the protective spectacles can screen a movie inside the lenses. It's like watching a movie at home! I hope I've been able to answer some of the questions you may have had about getting a root canal in the first place. Bear in mind that all the alternatives to root canal will have similar issues of discomfort, cost, and length of appointments. In between the two extremes of getting a root canal and getting the tooth pulled there are one or two things that may help to put off the decision for a bit. Painkillers. If you have a bad toothache, you can take some ibuprofen or paracetamol. This should only be the recommended dose, and for a limited period of time. Antibiotics. If the tooth has an infection or abscess, it is possible that antibiotics will settle it down for a while. But not all bacteria involved in a dental infection are killed by antibiotics. After a while, the infection will come back. You can read more about the options for antibiotics at Tooth abscess antibiotics. Toughing it out. If you can put up with the pain long enough, it MAY ease off for a time. But this is dangerous. It will always come back, and will be worse. In severe cases, you could end up with a life-threatening infection. As you see, there is only one long-term root canal alternative. At times, this can be a sensible decision, for example where a tooth is badly broken down and likely to split in the near future. Here is more information on this option, at Getting A Tooth Pulled. But in general, it's best to do whatever it takes to save your own natural tooth. Replacing a missing tooth is nearly always more complicated and more expensive than root canal treatment to save the tooth. Replacement usually involves either a fixed bridge or an implant. So, although an alternative to root canal may seem attractive at the time, you are "burning your boats"! Once the tooth is gone, it's gone for good. No way to put it back. My advice? If you need a root canal, get it done, preferably by a specialist with a good reputation. It's the best option in the vast majority of cases.